Besides that it seems to me that Love is a perfect feeling, so when you love someone you see no drawbacks in your partner, so that he becomes perfect for you:). I have passion for life and that is why I know my goals for the future pretty well. Are you looking for Ukrainian women? if you made up your mind to find Ukrainian women, you'd better learn a bit more before you start. Not only can the distance be an issue, but there are also cultural differences that can make the process of looking for Ukrainian brides more complicated. In the articles below we briefly describe some practical things that may simplify and improve your personal adventure. We want you to know more about the way Ukrainian girl think and feel about getting married to a foreign man. You should clearly understand all stages you have to go through to marry Ukrainian woman and choose your own way to ensure success. We have many successfully married couples and may give you helpful advice based on their experience. We want to help you to reach your goal - check more babes from Ukraine pics in our gallery! And remember: to find the right partner you must be the right Ukraine bride yourself. First of all we want to assure you that the majority of Ukrainian women dating western men are NOT just desperate to find foreign husbands or immigrate from Ukraine. The women of UaDreams.com are typically well educated, attractive, and smart. You can see them in our Gallery of Ladies. It would be a mistake to think that they are only after a green card or a passport. They seek compatible partners. As a matter of fact, women from Ukraine are looking for healthy, financially secure, good-looking men, though we should admit that appearance is not first and foremost for beautiful Ukrainian women. In Ukraine we have sayings like "A pretty face may not make you happy, but a loving heart will." Very few of Ukrainian women (if any!) are dreaming of getting married to homeless, ugly men with bad character and health problems who struggle everyday to survive. Now let’s discuss what are the most important things for Ukrainian woman. Love and security are number one. Those two things are the most important. In the majority of women's applications for a potential partner, you will surely read: "I want my future husband to love and understand me". Another popular requirement you will find in a woman's questionnaire is "financial security". In short, it means, you must have at least a home to live in, a stable job, and be able to provide for a family of three. You don't have to be a millionaire. 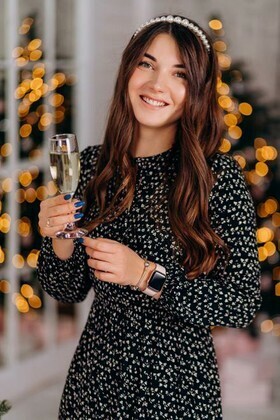 It is good enough to have a stable job; but the better your financial situation, the easier you will make contact with nice Ukrainian women, and the less obstacles you will get from the USCIS in bringing your fiancee into the country. In no way does this mean that ukrainian women are looking for your money. Definitely not! They are looking for a compatible personality! However, we should admit that women have suffered so much in Ukraine with everyday life, they want to make sure it never happens to them and their families again. An Ukrainian wife will stick with you through any turn of fortune, whether you go up or down. But to consider you a viable option, she must be confident that you are not an unemployed bum. Ukrainian women look for a soulmate who has mutual aims. They want to create a family together, raise children and travel, build a family house and go in for sports together with their husbands. A Ukrainian woman will be interested in her husband's hobbys. Does he like watching football? Ok, future wife will tell him that he is welcome to watch as many games as he wishes, she will even support his favourite team. Ice hockey? Great, each real Ukrainain woman will be happy that her man is consumed with some interesting hobby. Your good financial standing may impress Ukrainian brides at first, but then other factors will count: you must develop a relationship that works, and this involves mostly emotional factors. Love for Ukrainian women includes commitment. The women need assurance you are ready to offer this commitment. If you are not looking for a Ukraine wife, Ukrainian women won't take you seriously. They are not looking for pen pals.